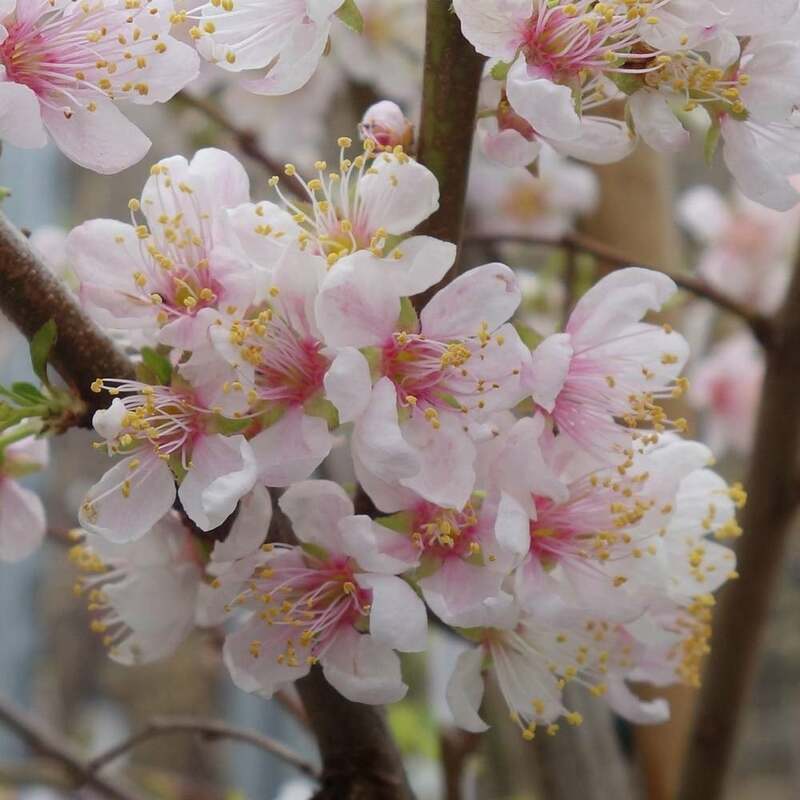 Prunus cerasifera 'Princess' is a very small ornamental Cherry Plum tree with pale pink blossom decorating the branches throughout spring. The flowers have stronger pink centres and open wide as the petals fade to white. This Cherry Plum tree has oval green leaves and an attractive, smooth and shiny bark showcasing a variety of dark brown hues. The edible plum fruits that are produced in autumn are ideal to use in jams and pies. Ideal for smaller gardens, Prunus cerasifera 'Princess' is estimated to reach a height and spread of 3 x 3 metres in 20 year. It does well in both full sun and partial shade, as well as all soils (other than very wet). Our pot grown 'Princess' Cherry Plum trees can be planted at any time of the year. Choosing a location away from strong winds protects the blossom display. Start by removing weeds and grass within a metre of your desired planting hole. Dig a square hole as deep as your root mass and approximately 1.5x as wide. To help the tree establish more effectively, sprinkle root grow in the hole. Remove the pot, gently loosen the roots and place into the planting hole. Mix 50% of the original soil with 50% compost. Fill in the hole and firm around gently, taking care not to bank soil up around the collar of the tree. We recommend planting Cherry Plum trees with a stake and tie kit to help anchor the roots - instructions are in the planting guide. When planting Ornamental Plum trees in spring or summer, water well for the first few months. Increase watering if there are extended periods of hot or dry weather. When planting in autumn, you may only need to water a little. Although you can leave 'Princess' Cherry Plum trees to their own devices, if you prune them for the first few years they will create a more balanced branch framework and healthier trees in the long run. After two to three years, you will only need to remove any damaged or unwanted branches.